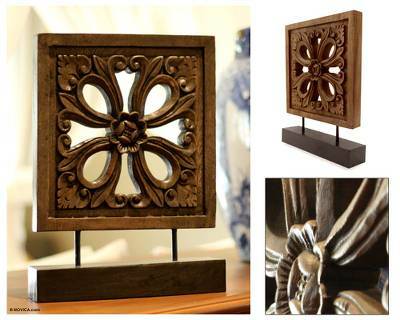 Thai Wood Sculpture, "Floral Square"
Extending its petals in stately symmetry, a flower fills a square frame. Jaifah Aksornsri presents this handsome wood sculpture in the traditional Thai style. "This is my talent. I don't know where my skill and love for it comes from. My heart says it's because I've seen and been involved with my parents' work since I was young." "Sawaddee ka. I'm Jaifah Aksornsri or Fah, and my name means 'of the sky.' I was born on October 19, 1964 in Chiang Mai province. After my parents got married, they moved to a larger city to start their family and get a new chance in life. We are two children – my older sister and me. "In town, my parents started making hill tribe dolls and silverware, and sometimes they sold antiques. My mom told me she'd took her goods in a bicycle basket or sometimes carry them her shoulder to sell at the hotel near the railway station. The same year I was born, they opened a shop. Many years later, they opened a bigger shop for silver and antiques. They loved to collect antiques and didn't want to sell them all. They wanted to protect many of them so that people from future generations could know about our art, styles and culture. My mother was the first person who thought of copying the antiques and selling the copies while keeping the originals. Part of our house is like an antique museum that we open to students and people who are interested. "For many years, my parents tried to copy the antique style and became experienced in this. Then they branched out into lacquer ware. Now my older sister works with the silver and antiques while I look after the lacquer ware. After I graduated from college, I wanted to study for a master's degree or find a job like all of my friends did, but my parents wanted me to learn their work. They told me, 'This job is a real-life university.' I've learned by doing it all my life. They wanted me to succeed and try to protect their wisdom. This is my talent. I don't know where my skill and love for it comes from. My heart says it's because I've seen and been involved with my parents' work since I was young. Throughout my childhood, my friends were people who helped my parents, like the painter, the carpenter and the woodcarver. "I grew up in the warmth of my family's love and understanding. My father taught us to do the best things in our lives. He taught me as I learned by doing that I should know where the wrong way is. My father always told us how our work should be of the best quality and please our buyers. The most important thing he taught us is to be honest in our work and with everyone. He passed away more than 15 years ago, but his words are still in my heart and go everywhere with me. I'm very proud of my parents – they were wonderful."